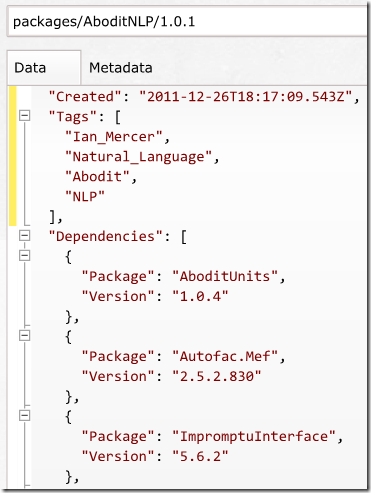 This is imply going to NuGet and asking for the packages in json format. It is very easy for us to work with json data with RavenDB, so that is what we are doing. I am not really sure why we have this “d” as the beginning of the json results, but that is what NuGet returns. We iterate over the query results, and write all of them to RavenDB. You might note that we use the Defer() option, which means that we can rely on the session to handle batching for us and only go to the server once, when we call SaveChanges(). 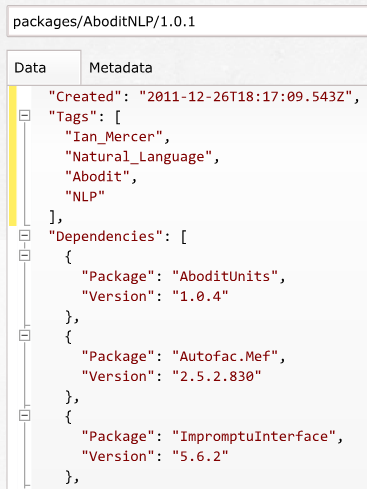 We also set the document metadata to be pretty basic, merely indicating that this should go on the Packages collection. Finally, we set the id to be composed of the package id and the version, resulting in a unique and human readable key for the imported package. Note that we return the next page location, and continue on working on that in the next page loop. That isn’t a really nice way to work with the data, so before we save the results to RavenDB, we modify it slightly. Now that is much more like it. On my next post, I am going to show how to do some queries againt this data, which currently have about 66,483 results.